Sculpture Size: 5.75 X 5.5 X 2.25 in. This adorable frog with the grooves on his back will sneak his way into your heart. It’s fun to stroke the neat lines on his back…you do pet your frogs, don’t you? “Sneaky Pete” was named after a friend of Tim’s and has a really nice golden yellow patina. Looking for unique one of a kind display ideas? 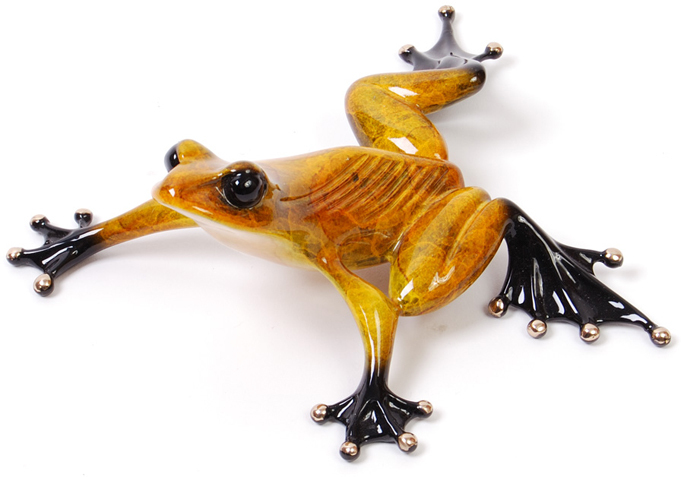 "Sneaky Pete" fits on a Medium or Large Glass Lily Pad. See Display Accessories Section.